In the latest reports in English from major media as well as the historical ones, Yao’s on-the-court performance has been well covered and concluded, however, very little could be found about Yao’s off-the-court influence, which should probably worth more attention and it will help us predict what a bizarre career Yao Ming may possibly have after NBA. Let’s take a look at “the Yao Ming effect” over the last 9 seasons. 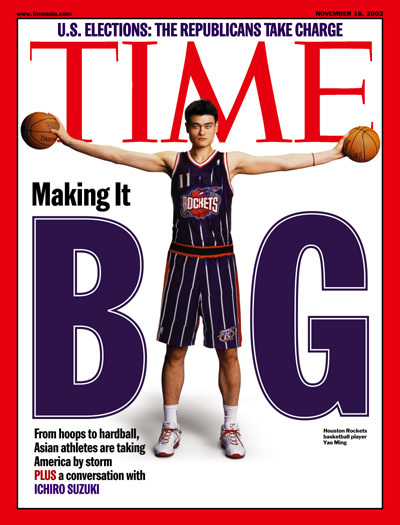 Yao was listed on Time Magazine’s list of the 100 most influential people in the world. To most of the Chinese, Yao Ming means far more than the Rockets middle. He has been recognized as an oriental hero, a cultural hero and a cultural brand by the official Chinese media. Besides being an NBA player, he is also the current boss of the CBA team Shanghai Sharks, the founder of the Yao Ming Foundation and of course the spokesman for multiple top brands among others. The Yahoo! Sports NBA columnist Adrian Wojnarowski calls Yao Ming “one of the seminal figures in the globalization of the NBA”. Yao Ming’s success in NBA triggered an overwhelming NBA mania in China. Soon after Yao became the Rockets center, Chinese companies competed with each other to build a partnership with NBA, the Chinese provincial TV stations all increased their NBA broadcasting time and the professional basketball media came into existence in China. In the history of Chinese sports, there had never been a person as successful as Yao Ming. Because of Yao Ming, NBA has built a strongest cultural bond with China that has never been seen in other markets, and China has become the largest foreign market for the NBA. It was true that NBA got popular in China since the Jordan Era early in the 1990s. However, back then most of the Chinese basketball fans were only interested in watching the games, the popularity of NBA did not drive too much consumer spending. Although NBA games were amazing to the Chinese people, the NBA league seemed to be far away from their life until Yao Ming built the bridge. For the first time, the Chinese fans found NBA could be so close to them. Since Yao Ming’s arrival, the Houston Rockets has suddenly become a major team in the Chinese fans’ eyes. And his influence went far beyond the Rockets. The Chinese extended their love of Yao Ming to T-Mac, Battier and even Yao’s opponent O’Neal. The Chinese brands soon took action to leverage on Yao’s influence. Yanjing Beer’s logo appeared at the Toyota Center, China Unicom signed Yao Ming as brand spokesman. Since Yao already signed a shoe deal with Reebok, the Chinese domestic sportswear companies had to find other creative ways to get a slice of the pie. Soon Li Ning offered O’Neal a fat contract to try to boost sales with the Yao vs. Shaq story, Peak followed by signing Yao’s new teammate Battier. Even Adidas did not waste Yao’s influence by frequently sending McGrady to promote his shoes in China. With Yao Ming’s influence, NBA has got nearly 20 brands as official marketing partners in China over the years, the current list include Peak, Mengniu, Qingdao Beer, Everbright Bank, Vinda, Simcere Antine, Vancamel, OPPO, Haier, Hainan Airline, Amway and Dongfeng Aeolus. In 2008, NBA China was founded with a registered capital of $2.3 billion, of which $138 million was funded by Chinese companies including Li Ka-shing Foundation, China Bank, Lenovo and China Merchants Bank. Many of Yao Ming’s current or previous Rockets teammates got endorsement contracts from Chinese sportswear companies or made their career progress with the Chinese Basketball Association (CBA). Yao’s teammates Shane Battier, Kyle Lowry, Patrick Patterson and Carl Landry signed with Chinese sportswear brand Peak. Steve Francis and Luis Scola signed with Anta. And Chuck Hayes recently signed with Qiaodan. There are also over 15 NBA players from other teams signed with Chinese brands due to the Yao Ming effect, the list include Shaquille O’neal, Steve Nash, Evan Turner, Baron Davis and JaVale McGee. Here are Yao’s teammates currently or previously signed with CBA: Bonzi Wells (Shanxi Zhongyu), Mike Harris (Shanghai Sharks/ Dongguan New Century), Kirk Snyder (Zhejiang horses) and Steve Francis (Beijing Ducks). There are also over 10 former NBA players from other teams signed with CBA, the list include Stephon Marbury, Fred Jones, David Harrison, Smush Parker, DerMarr Johnson, Donnell Harvey, John Lucas III, Jelani McCoy and Chris Porter. The Yao Ming Effect 2.0 – Will Yao make the Shanghai Sharks a success? Out of the Rockets, Yao Ming has many titles. He is the global ambassador of the Special Olympics and the Shanghai city’s image ambassador. His Yao Ming Foundation has become one of the most influential foundations in China, donating RMB 20 million ($3 million) to support the education and health care in China’s less developed areas in the past year. He is also the investor of multiple enterprises. It can be predicted that he will stay active in different areas in the future. It was clear that Yao knew he would not be able to make money with the Sharks in the short term when he made the investment decision. But it would be too simple to conclude that Yao did this only to take his responsibility for his former team and his hometown. From other multiple Chinese media reports, it seems that Yao has a vision. He believes in the huge potential of the Shanghai Sharks in the long term. Yao expressed his goal to build an elite team in the next 10 years and beyond. Although the commercialization of the sports market in China still has miles to go, Yao Ming’s determined choice with the Sharks showed that he has a confidence on the future of China’s sports industry, probably the last untapped industry in China. According to Yao Ming’s good friend and the author of A Shorter Yao In My Eyes, Chinese basketball journalist Wang Meng, currently what Yao Ming spends most time on is the business of Shanghai Sharks. Wang has reported Yao Ming and the Rockets for six years and a half. It is said that Yao started to get hands on the management and development of the team since he was not able to play after the latest injury. From a player to a boss, he does have a lot to learn. China’s Oriental Sports Daily reported that recently Yao has taken a couple of site visits himself to choose a new arena for his team. Since Yao became the Sharks’ boss, the team did make progress over the past two seasons. It rose to the 4th in the league in 2009-2010 season compared with the second last in 2008-2009. The ticket sales ratio grew from 3% in 2008-2009 to 100% in 2009-2010, or RMB 1,000 to RMB 450,000 in numbers. Because of Yao Ming’s brand, the Sharks also got sponsorship deals from Maxxis, Subway, Haiyi Group, China Enterprise, Gammax and Mueller. This April, a 12-episode documentary “The Season” about the 2009-10 season of the Shanghai Sharks was premiered on CCTV-9. This is the first time in China TV history that such a long documentary is made about a professional sports team. The audience feedback was very positive that CCTV did a rerun during middle May. Yao Ming’s move with the Sharks also brought positive effects to the CBA league. The 2009/10 season saw an 80% increase in revenue for the CBA compared to the previous season. The 2009/10 season also made progress in TV figures from previous year, achieving total broadcast time of 3,500 hours and a cumulative audience of 436 million. The CBA Finals added a further cumulative audience of 31.5 million. But the problem is even so the Shanghai Sharks is still losing money with a reported loss of $3 million for both 2009/10 and 2010/11. And the Sharks team is still young, it will probably take a few more years’ development before the team becomes mature. Yao Ming is certainly taking a lot of challenges and pressure for the team. He talked a lot about patience and responsibility for the team during interviews. Will Yao Ming be able to afford the financial loss until the team turns into profitable and successful? And when will that happen? It would be hard to predict, as the CBA league and the whole sport market in China are growing in an environment full of changes and uncertainties. However, according to the reports the Shanghai government has a strong confidence on Yao Ming. They believe Yao Ming will add unique value to the team with his NBA experience, personal influence and wide resource. If the Sharks will be successful, it will definitely become a perfect name card of the city Shanghai. And therefore the government may provide some support to help the team grow. The macro economy also shows positive prospects. Historically, the growth of sport market in the developed countries was closely related to the growing spending power of the middle class. Up to now, 11.3% of China’s households have reached middle class level with an annual growth rate at 44% since 2008. The disposable income in China is predicted to grow at a double digit per year through 2015. In addition, back in 2002 who had imagined all these fat Chinese brand shoe deals for the NBA stars and all these former NBA players in the CBA? And who would believe that China would have become the most frequently visited country by the top NBA stars including Kobe Bryant and LeBron James, and that Wasserman Media Group would be proposing a Chinese basketball tournament during lock out using 15-20 NBA players? What‘s most amazing about China is probably its endless possibilities. We will find more answers from Yao’s press conference on July 20th.